Some friends and I (Arthur, Khawer and myself remain the key members here) have been going to every (free) museum within the 5 boroughs with the goal of finishing the big ones by the end of this week. Below is an entry briefly detailing my experience at MoMA: PS1 in Queens. Today we took the L to the E Uptown to 5th Av/53rd Street and went to the MoMA, where they currently have a Joan Miro exhibit called "Painting and Anti-Painting 1927-1937 " and two floors of work by Marlene Dumas entitled "Measuring Your Own Grave" (her self-portrait entitled Het Kwaad is Banaal (Evil is Banal) is pictured above). Dumas is a South African painter who really struck me, perhaps due to her sterile yet painterly presentation of corpses: the back room contains a series of three paintings, each of which contains a young-ish, faceless girl hanging from a noose. 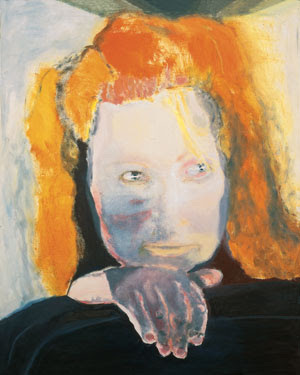 Depicting displays of colorful, blatant femininity as well as honest yet slightly abstracted portraits, Dumas' paintings are not only beautiful but also terribly important, since most women do not have a large voice when it comes to painting. Miro's exhibit was also nice, although his paintings have always seemed slightly childish to me. I'll probably expound on him later when I'm not so tired, and maybe also leave a list of other painters I really enjoyed (about a page in my sister-crafted owl journal in length). And so tomorrow the Gallery Gang will be hitting up the Museum of Natural History, a museum I've been to twice already but a place I never really tire of. Hopefully one of those goons remembers their camera, 'cause I really love those dioramas. Sorry. That's just the suburbs talking. What a lovely way to spend your days. In which museum did the kids hide in From The Mixed Up Files of Mrs. Basil E. Frankweiler? The Met! I always think of that book when I'm there and mention it to my friends and they all look at me like I'm nuts. Can't you totally imagine you & Mikey hiding out in there, scooping coins out of the fountain & eating at the Automat?